Nestled at the edge of the San Diego Bay, the hotel enjoys panoramic views of the bay and the city skyline. The all-suite hotel is built around the prestigious San Diego Symphony Hall, and is just steps from the Gaslamp Quarter. The 30 story Hilton is located on the waterfront, adjacent to the Convention Center and features several dining venues. This luxury hotel offers personalized concierge service, a rooftop pool and bar, and a fitness center. Formerly the Se San Diego, this hotel is located in the historic Gaslamp Quarter. Situated in the heart of San Diego, this hotel has an outdoor heated swimming pool, and a fitness center. Between Mission Bay and La Jolla, this 3-story, 73-room beachfront hotel offers a fitness center, a pool, & a jacuzzi. This Shelter Island hotel offers spa services, a fitness center, a pool bar, and complimentary airport transfers. 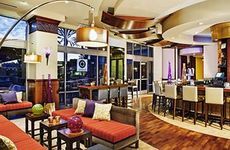 Located across from the San Diego Convention Center, this hotel features a poolside bar and a coffee shop. A contemporary new guest experience which includes plush beds, stylish Kids Suites, and sparkling pool. 35-room luxury boutique hotel in San Diego's Gaslamp District has modern decor within a historic 19th-century building. This 225-room hotel offers free in-room high-speed internet access, a fitness center, a pool, and a 9-hole golf-course.